Society is increasingly affected by climate impacts, from prolonged water shortages to damaging coastal floods and wildfires. Scientists studying climate variations are eager to have their knowledge used in adaptive decision making. To achieve this, science and society must engage productively around complex management and policy challenges. For over 20 years, the science-society interface has been fertile ground for the Regional Integrated Sciences and Assessments (RISA) programs sponsored by the U.S. National Oceanic and Atmospheric Administration. 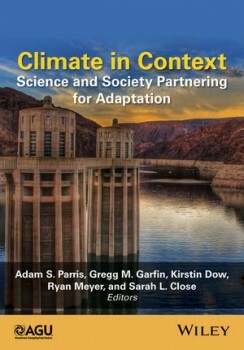 A new book is available on how SCIPP and its RISA counterparts work with stakeholders to co-produce climate science knowledge, policy, and action. The book, Climate in Context, is a state-of-the-art synthesis of the lessons learned by RISA programs. Through case studies from various US regions, this book provides lessons and guidance for organizations and individuals who want to work at the science-society interface on a range of climate challenges. Climate in Context includes four sections: Understanding Context and Risk, Managing Knowledge-to-Action Networks, Innovating Services, and Advancing Science Policy. Dr. Mark Shafer was the lead author on the chapter Managing the 2011 Drought: A Climate Services Partnership. Ms. Rachel Riley was a contributing author on the chapter Assessing Needs and Decision Contexts: RISA Approaches to Engagement Research. More information on the book can be found here: http://www.wiley.com/WileyCDA/WileyTitle/productCd-1118474791.html.